To monitor the full duplex BroadR-Reach® Ethernet physical layer, you need to insert an active gateway. This specialized gateway passes all traffic between the BroadR-Reach® devices at nearly zero latency and also makes two copies for the connected 100Mbps Ethernet tool - also at wire speeds. 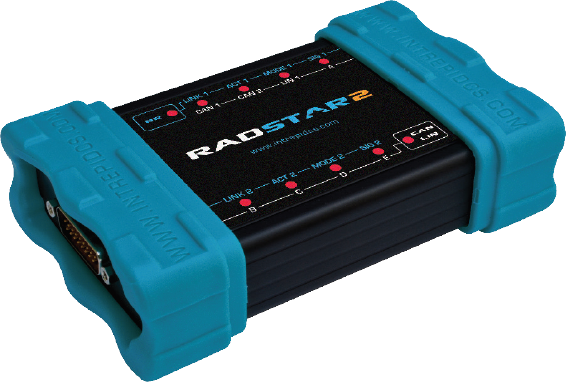 The RAD-Star 2 has the ability to test between two ECUs (hosts) or between an ECU and a 100BASE-T1 swich, plus two CAN FD networks, with up to 10 ns time accuracy. This makes it ideal for ECU testing applications, as well as port to port and Ethernet to CAN FD latency testing. Tap copies full duplex communications between master and slave with low latency. Can serve as a BroadR-Reach® (100BASE-T1) to 10/100/1000 Mb Ethernet bridge. Simulate errors by introducing errors between master and slave. 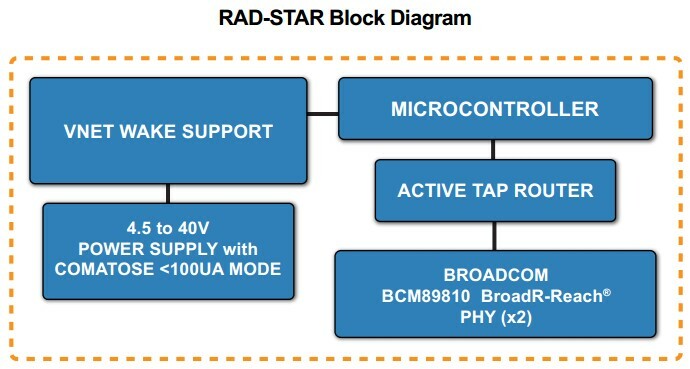 The RAD-Star device contains four Ethernet connections. Two Ethernet connections are connected to the BroadR-Reach® physical layer. Two Ethernet connections are connected to standard 100Mbps Ethernet that routs traffic to a PC using Vehicle Spy. A high speed intelligent router manages message passing between Ethernet PHYs.